Present day Punt Road, Cobram. 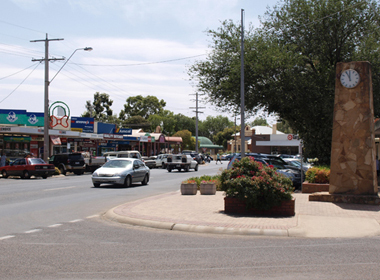 Cobram is a town on the Murray River, approximately 250 kilometres north of Melbourne. It lies in the fertile Murray Valley region, with large dairy, beef and fruit industries. During the summer months and at Easter time, activity in the town grows considerably with the arrival of tourists. Cobram, along with the major centres Yarrawonga, Numurkah, Nathalia, and their districts, is part of the Moira Shire. The estimated population for the shire is well over 26,000 people. Cobram makes up over a fifth of that figure, with about 5,500 people in the town. under the former leader Steve Bracks, promised to conduct a feasibility study into reopening the line but found that it was apparently not feasible to return passenger trains. The points to the branch were lifted in mid 2008 and the Moira Shire has completed the purchase of land east of the Murray Valley Highway from VicTrack. 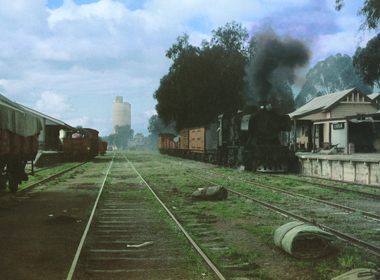 Cobram, 1965. Photo by Rolf Frank, courtesy Train Hobby Publications. The intention is to build a layout based on the 1965 plans of the terminus station, but with trains of all periods through to the 2000s operating. This provides for a diverse mix of steam and diesel locomotives. The station setup is pretty straightforward, and typical of a VR terminus. Cobram features a 53' turntable, ash pit, water tank, passenger and goods platforms and yard crane, stock sidings and numerous roads suitable for shunting and marshalling small goods trains. Below you can click through to aspects of the railway station environs. The layout will be built with approximate dimensions of 1m x 8m, consisting of at least 4 panels 2m long. It will feature a track plan that resembles the 1965 plan of the Cobram yard. Below is an example. Although no work has progressed on the layout yet, models of locomotives and rollingstock are always being prepared, until work can commence on the layout of Cobram. As time and work progress, information will be added here.